Saint Michael the Archangel, guardian of the Church, patron saint of police officers, grocers, mariners, and paratroopers. Is the spiritual warrior that defeated Satan in his dragon form. Casting Satan and his cohorts out of heaven and thrown down to earth. Often considered to be a champion of justice and healer of the sick. It is said that St. Michael will achieve victory again, during the final battle against Satan. He is also known as the Christian angel of death, and at the hour of our death, Saint Michael descends and gives each of us a chance to redeem our souls before passing. As such, Saint Michael is often depicted as holding scales, that he will use to weigh our souls for judgement. 1 Who Wrote the St. Michael’s Prayer? 2 Which Pope Started the St Michael Prayer? 3 When Was the St. Michael Prayer First Used? 4 When Did the Catholic Church Stop Saying the Prayer of St Michael? 5 Why is the St. Micheal’s Prayer No Longer Part of Mass? 6 What is the St. Michael’s Prayer Used For? Who Wrote the St. Michael’s Prayer? It is said that following a mass in 1886, Pope Leo XIII had a terrifying vision of the St. Michael, locked in battle with Satan and his demons. Although he saw St. Michael being victorious and successfully driving Satan and minions back into hell. Pope Leo remained troubled by the destruction and saw in his vision, and sought to strengthen the faith of Catholics across the world, in order to help the faithful defend against the struggles that he could foresee. Which Pope Started the St Michael Prayer? Pope Leo XIII started this prayer. When Was the St. Michael Prayer First Used? After writing the prayer, Pope Leo XIII added the St. Michael prayer to the Leonine Prayers. Prayers that the pope had instructed all Catholics to recite following Low Mass in 1884, in defense of the Holy See’s independence. He sought God’s help to find a satisfactory solution to the loss of the Pope’s temporal sovereignty, in order to be able to effectively use his spiritual authority. 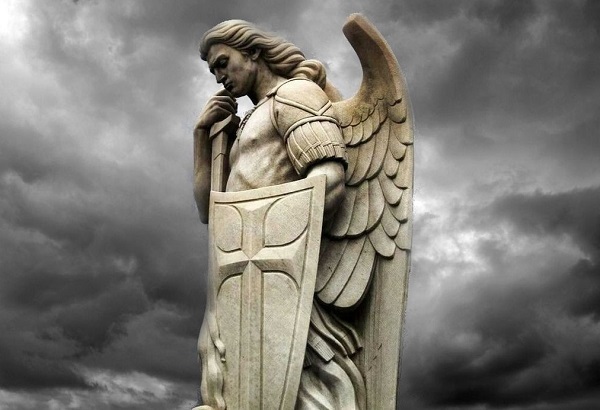 When Did the Catholic Church Stop Saying the Prayer of St Michael? The catholic church stopped use this prayer during mass, in 1970. Why is the St. Micheal’s Prayer No Longer Part of Mass? Low Mass was discontinued in 1970 after the Second Vatican Council’s Constitution on the Sacred Liturgy was enacted, and Latin was stopped being used by the church. Saint Michael’s prayer would no longer be recited at mass. But in 1994 Pope John Paul II, urged all Catholics to continue reciting it as part of their weekly prayers. Today Catholics are free to recite the St. Michael prayer at home, in the church outside of mass, at work, or abroad. What is the St. Michael’s Prayer Used For? While it is true that the St. Michael’s prayer is an exorcism prayer. It wasn’t intended to be used as a rite for an individual demonic possession, per se. But for warding off and combating evil, driving it back from an area, community, or individuals. During world war 1 and 2, people would pray the St. Micheal’s prayer together, in the hopes of being spared a death at the hands of the enemy forces. Similarly people may recite it during periods of natural disasters, or civil unrest. Any time that their lives may be at risk of being taken due to an act of evil, the St. Michael’s prayer can offer protection. As St. Michael is a champion of justice, individuals may pray for his aid to see that people are punished for their crimes. Saint Michael will not grant revenge mind you, as revenge only goes towards feeding our own sins. He could be asked to aid in your own personal security, or for a guiding hand that can end you out of a dark place, and to resist evil influences. Originally published in the Roman Raccolta, in 1898, and supplement approved, in 1902. This version of the St. Micheal’s prayer, would later be published in the Raccolta, twelfth edition, in 1935. In the Name of the Father, and of the Son, and of the Holy Ghost.O glorious Archangel St. Michael, Prince of the heavenly host, defend us in battle, and in the struggle which is ours against the principalities and Powers, against the rulers of this world of darkness, against spirits of evil in high places. Come to the aid of men, whom God created immortal, made in his own image and likeness, and redeemed at a great price from the tyranny of the devil. Fight this day the battle of the Lord, together with the holy angels, as already thou hast fought the leader of the proud angels, Lucifer, and his apostate host, who were powerless to resist thee, nor was there a place for them any longer in Heaven. But that cruel, that ancient serpent, who is called the devil or Satan, who seduces the whole world, was cast into the abyss with all his angels.